An automated system for mounting and dismounting pre-frozen crystals has been implemented at the SIBYLS beamline. DOMO is based on the Stanford Automounting System (SAM) developed at the SSRL which was designed around the EPSON SCARA robotic arm. The pre-frozen crystals are mounted on standard Hampton Research 18mm CrystalCap Copper Magnetic pins and held within a compact cylindrical cassette, each holding up to 96 crystals. A dispensing dewar holds two cassettes under liquid nitrogen on a platform adjacent to the goniometer. DOMO uses a small magnetic tool to extract samples from, and insert samples into a cassette, and a cryo-tong tool to transfer them to and from the goniometer. DOMO is controlled via the Blu-Ice GUI. In general ice is your enemy. Use fresh liquid nitrogen. Freeze crystals in small batches. The SMB group at SSRL has extensively documented best practices for preparing samples and loading them into the cassettes so I will refer you to their instructions. This is the foam dewar and assorted tools that come with a cassette loading kit. You can purchase these from Crystal Positioning Systems or if you just want to try it out first I can probably lend you a kit. Please call (510.495.2697) or email me sclassen@lbl.gov for requests. DOMO (Dynamic Offsite MX(Macromolecular Crystallography) Operator) mounted crystals remotely for the first time today. The user accessed the beamline via port 22 (i.e. ssh) from San Diego using NX Client and was able to successfully screen through 50 or so crystals. Although I could have monitored the shift from my office, from home, or from Tahiti, I thought it would be more prudent to remain close to the beamline in the unlikely event that intervention was needed…. Well I’m glad that I stuck around. Although DOMO performed well, there were a couple of times that I needed to step in a make things right. Overall, however, it was a very successful first run. If you are interested in collecting crystallographic data from the comfort of your own lab (or Tahiti) I would encourage you to apply for time on the SIBYLS beamline. We have a small supply of sample cassettes and the necessary tools for loading the cassettes. A cassette kit can be sent to you, whereupon you load the cassette with your valuable samples, and thusly send it back to the beamline in time for your shift. It’s loads of fun! Eight easy steps to connect to the SIBYLS NX server through the beamline firewall. These instructions will work for OS X and Linux. We've also compiled more detailed instructions when connecting from a Windows PC. 1. Download and Install NoMachine NX Client. 2. Launch the NX Client and create a new connection. 3. Under the Advanced Settings check the "Use the NoMachine login" box. 4. Use your SIBYLS computer account username and password. When you connect for the first time I believe you will be prompted to accept the server key. Just click "yes". 5. you will then need to create a new desktop session. Please select Gnome Desktop. We don't have any of the other window managers installed. 6. You are now connected to kona and should have a desktop available to you. You may want to make it fullscreen and set the 1:1 pixel option to make the best use of your monitor. Scott Williams, a postdoc in the Tainer group at The Scripps Research Institute, was the first crystallographer to use DOMO. 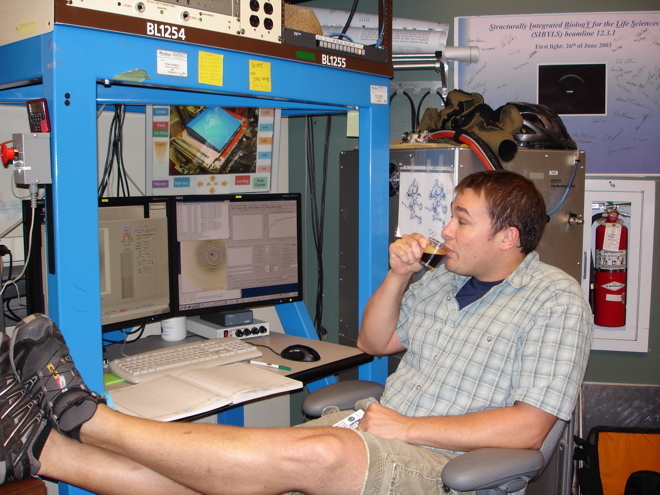 Here he is kicking back and enjoying some of the fine espresso available at the beamline while DOMO mounts his samples from the custom LN2 sample dewar in the hutch. Scott screened through ~40 samples during his 16 hour shift, and collected several useful datasets.